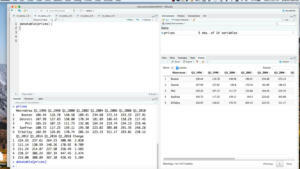 In this fourth episode of Do More with R, Sharon Machlis, director of Editorial Data & Analytics at IDG Communications, shows how to create dashboards in the R language with the flexdashboard package. Hi, this is Sharon Machlis, Director of Editorial Data & Analytics at IDG Communications. 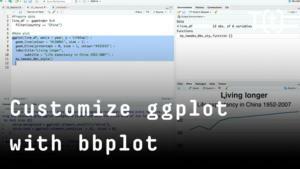 I’m here with episode 4 of Do More With R: Build a quick dashboard. 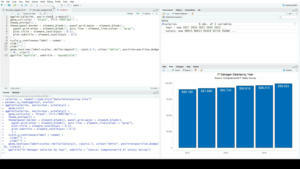 I’m going to show one of the easiest ways to create a dashboard in R: Using the flexdashboard package. And you’ll see an option to create a document From Template. 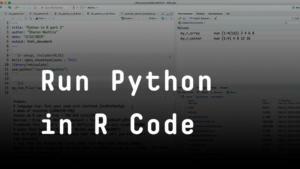 If you’re not familiar with R Markdown, it’s a way to mix text, graphics, and R code, and create output like HTML or Word. And there should be an option for a Flex Dashboard. I’ll make sure that’s selected, and click OK. This is the default template. That top header between the three dashes is in a format called YAML, Y.A.M.L. 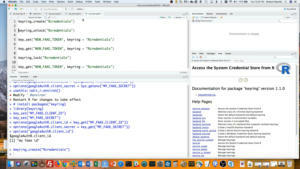 It’s setting up the document output. This YAML says: Make this R Markdown document a flex dashboard, set it up by columns (you can also set it up by rows), and have it fill the entire available browser space. You can see the dashboard is set up for one wider column with one item, Chart A; and one narrower column with two items, Chart B and then Chart C below it. Now I need to create the graphics. 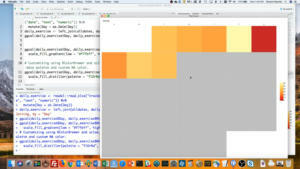 R code to create the charts and graphs goes inside these gray areas. You create those R code block sections with three backticks followed by a small letter r in braces to start, and three backticks to end. 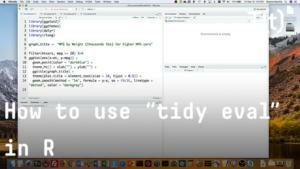 I’m going to start adding R code to my dashboard by loading some libraries I know I’ll want. I’ll also import some data from last year’s Computerworld IT Salary Survey that I’ve got in a spreadsheet. 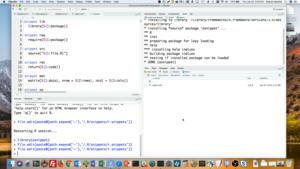 You can use any R libraries you want, I’m going to use rcdimple for a bar chart and DT for a table. I’ll also give the dashboard a title. And the data is imported. 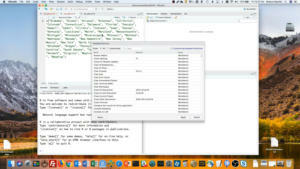 I can take a look at that in RStudio by clicking the variable name. Since this is a dashboard, it would be nice to have something graphical to highlight the latest salary number. And maybe show whether it’s up or down from the prior year. Flexdashboard’s valueBox function creates that kind of dashboard box. 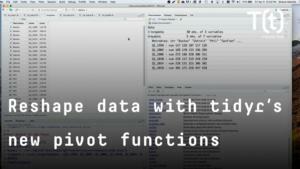 The first line of code sets the arrow icon. If the first salary number if greater than the second one, I want to use font awesome’s up arrow. Otherwise, I’ll use the down arrow. I realize that means if the salary stays exactly the same it will still show a down arrow. I’m OK with that (after all, given inflation, if your salary stays the same, real purchasing power has gone down). The second line of code sets the color: “success” if the salary has gone up, “danger” if the salary’s gone down. valueBox includes a few built-in color names like success, danger, warning, and info. You can also use color names. 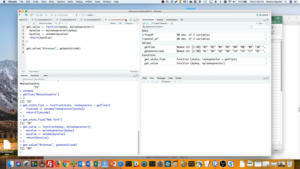 The last part is adding a table with the salaries, which I’ll do with DT’s datatable function. 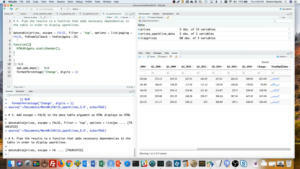 RStudio has a lot more about flexdashboards at rmarkdown dot rstudio dot com slash flexdashboard. That’s all for this episode, thanks for watching! 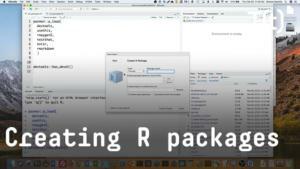 For more R tips, head to the More With R video page at bit.ly/morewithR. That’s https B I T period L Y slash more with R, all lowercase except for the R. So long!